BAT - BLOG : BATMAN TOYS and COLLECTIBLES: 1966 #BATMAN BATMOBILE VS GREEN HORNET BLACK BEAUTY Car Race This Sunday at Raceway Park, NJ!! 1966 #BATMAN BATMOBILE VS GREEN HORNET BLACK BEAUTY Car Race This Sunday at Raceway Park, NJ!! 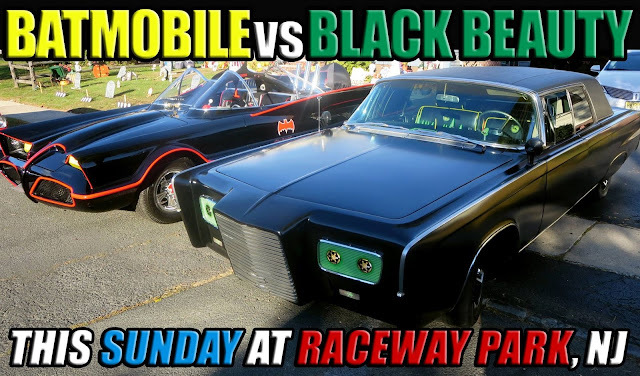 Just a quick post to share the awesome news that this Sunday, October 25th, at the RACEWAY PARK in Englishtown, New Jersey, there will be an ULTIMATE DRAG RACE between the 1966 Batman TV Series BATMOBILE and the 1960's Green Hornet TV Show BLACK BEAUTY!! For tickets and info just CLICK HERE! BATMAN™ and all related characters, logotypes and elements are trademarks of and © DC Comics, also TM and © Warner Brothers Entertainment Inc. All rights reserved.This site is not authorized by Warner Bros or DC Comics. This is a fan site dedicated to joy of collecting Batman and no copyright infringement is intended. Batman created by Bob Kane and Bill Finger. BAT-BLOG.COM © 2016 Tommy Brookshire. Awesome Inc. theme. Powered by Blogger.